The Delaware Coast. Those words conjure images of pastel sunrises and brilliant sunsets; of historic communities and wooden boardwalks; of memories past and vacations present. 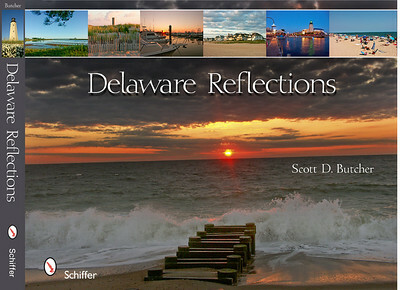 Delaware Reflections captures the essence of the Delaware Coast through Scott Butcher’s stunning photography of Lewes, Rehoboth Beach, Dewey Beach, Bethany Beach, and Fenwick Island, as well as Cape Henlopen State Park, Delaware Seashore State Park, and Fenwick Island State Park. Take a tour of Delaware’s coastal towns, beaches and bays through this keepsake book, and visit the beach all year long.